Many studies of the neural bases of language processes are now conducted with functional and structural neuroimaging. Research is often compromised because of difficulties in identifying the core structures in the face of the complex morphology of these regions of the brain. 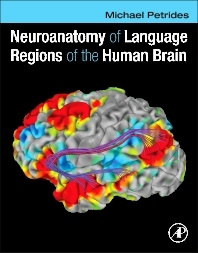 Although there are many books on the cognitive aspects of language and also on neurolinguistics and aphasiology, Neuroanatomy of Language Regions of the Human Brain is the first anatomical atlas that focuses on the core regions of the cerebral cortex involved in language processing. This atlas is a richly illustrated guide for scientists interested in the gross morphology of the sulci and gyri of the core language regions, in the cytoarchitecture of the relevant cortical areas, and in the connectivity of these areas. Data from diffusion MRI and resting-state connectivity are integrated iwth critical experimental anatomical data about homologous areas in the macaque monkey to provide the latest information on the connectivity of the language-relevant cortical areas of the brain. Although the anatomical connectivity data from studies on the macaque monkey provide the most detailed information, they are often neglected because of difficulties in interpreting the terminology used and in making the monkey-to-human comparison. This atlas helps investigators interpret this important source of information. Neuroanatomy of Language Regions of the Human Brain will assist investigators of the neural bases of language in increasing the anatomical sophistication of their research adn in evaluating studies of language and the brain. "...an excellent resource for understanding neuroanatomical characteristics of the human brain as it relates to nonhuman primate neuroanatomy."